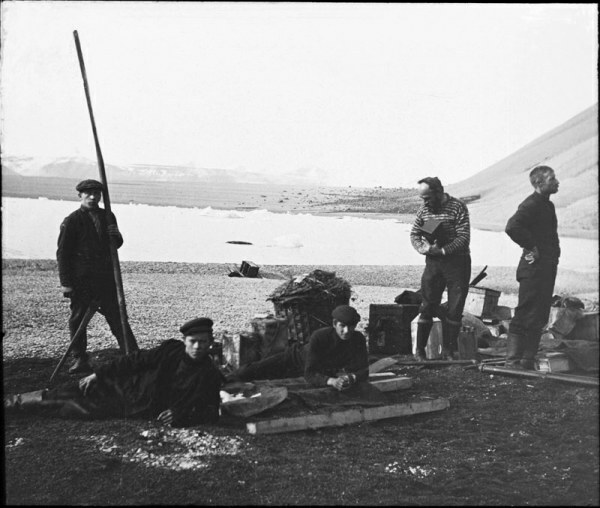 Following his successful Scottish Antarctic Expedition of 1902-04, Dr. William Bruce spent much time between 1906 and 1919 exploring Spitzbergen, where the mineral deposits were of considerable economic interest. Not only was coal found in abundant quantities, but so also was high-quality iron ore and many other minerals. This eventually led to the establishment of the Scottish Spitzbergen Syndicate, and to an exploratory expedition led by Dr. Bruce in 1919, involving thirteen volunteer miners from the Carriden (West Lothian) coal mine of the Bridgeness Company Ltd, led by their foreman, George Miller. This photograph shows Bruce and his party landing at Bjona Haven during an earlier expedition in 1912.